For over one hundred years, the International Critical Commentary series has held a special place among works on the Bible. It has sought to bring together all the relevant aids to exegesis  linguistic and textual no less than archaeological, historical, literary and theologicalwith a level of comprehension and quality of scholarship unmatched by any other series. No attempt has been made to secure a uniform theological or critical approach to the biblical text: contributors have been invited for their scholarly distinction, not for their adherence to any one school of thought. The first paperback editions to be published cover the heart of the New Testament, providing a wealth of information and research in accessible and attractive format. 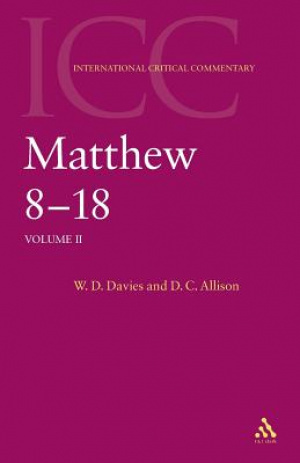 Matthew 8-18 : International Critical Commentary by Dale C. Allison;W. D. Davies was published by Continuum in May 2004 and is our 26102nd best seller. 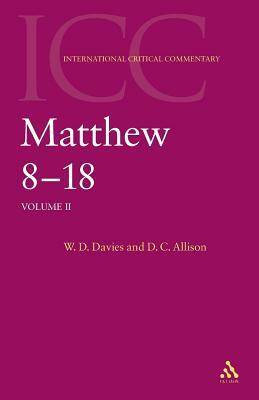 The ISBN for Matthew 8-18 : International Critical Commentary is 9780567083654. Be the first to review Matthew 8-18 : International Critical Commentary ! Got a question? No problem! Just click here to ask us about Matthew 8-18 : International Critical Commentary .